Love Cinza Rocca! Got a black wool cashmere coat – wide lapels, belted at waist – from this brand fo $400 from Saks 2 yrs ago and it’s PURE LUXURY. Not sure about camel with my skin tone but should look great on blondes! I think it depends on your coloring (both hair and skin tone) as a blonde . . . I am blonde and love to wear camel! Camel looks hideous on me as well. I avoid it like the plague. I have a neutral skintone and need something that’s a little less neutral. What’s a neutral skintone? I’m not trying to be snarky, but I would assume that there are so many shades of skin that could be considered neutral that it becomes a meaningless description. I’m not the OP, but the term neutral is normally used to mean she has neither warm nor cool skin tone. There’s something just a little ‘blah’ about this coat. Not digging it today. I have to say I’m not digging it either. Maybe the details in person make this worth the price, but from here, it just looks kind of dull (not bad, just not worth the “splurge”). On an aside: today & tomorrow — enter code SAVEBIG for 30% off of Gap, BR, ON + free shipping. My reaction is the opposite – I’m more likely to splurge on something that is not very fashion-forward. My theory is that I’d be able to wear it for years and amortize the cost. This coat is pretty neutral, although I’m sure well tailored. I can imagine wearing it every day in the winter for years (and I’m in Chicago, so that’s 9 months of the year). I would generally agree 100% — e.g., I would be vastly more likely to “splurge” on a classic black suit than, say, a distinctive looking boucle jacket. I guess I just find this jacket really boring. Like, I would maybe buy this on sale at Land’s End b/c it’s super practical. Not like I want to spend more than $150 dollars on it. Note: Savebig does not apply to Women’s Pants…. I bought the classic trouser in charcoal, and its a great staple so am going to get the black but sale does not apply…. I think it’s nice, but would that collar conflict with one’s hair? Like possibly make it less than even in the back? I’d definitely want to try on to find out before purchase. Ditto; I’m also thinking that if you have long hair, then in the winter it would make it a frizzball by the time you got to work. I have a similar standing collar coat (and hair below my shoulders). It’s not really a problem. My hair goes to either side or falls over the back. Plus, if it’s cold enough to wear a wool/cashmere coat, I’m almost always wearing a scarf that goes up that high on my neck. I have a JCrew coat with a standing collar and it’s never been a problem for me (hair slightly below shoulder length). I really like the standup collar in the midwest – provides some protection from the wind and gives the coat a bit of character. The only thing is that to maintain the “prettiness” of the coat, I wear a thin scarf underneath the coat as opposed to the normal midwest wrap around and cover your whole face method. This limits my scarf options. Granted, however, the looking pretty part usually goes out the window on those really blustery days and I’ll do whatever it takes to keep warm! Love this. Crossing my fingers and hoping Bluefly marks it down a little more before they run out of my size. This coat would definitely be a multi-year investment. I agree that it’s blah and it doesn’t have any details that make it interesting. Also not a fan of the color — I bought two camel colored coats and realized after the fact that the color is just not good for my “winter” coloring. I look really washed out. My favorite winter coat is a wool, bright green one. I never fail to get compliments when I wear it and it makes me happy wearing such a bright color. Does anyone know if it’s possible to dye a wool/cashmere coat? A few years ago I splurged on a J Crew wool/cashmere plaza coat with thinsulate in camel (it actually looks very similar to the coat above). I wore it a lot during that first winter, but later realized that camel makes me look like death when I’m already winter pasty, so it hasn’t gotten much wear since. I love the cut and the fit, but hate the color. Any suggestions, especially for professionals in the NYC area? As an aside, this is a perfect example of why those “must have” lists are not one-size-fit all. A camel coat is a great classic that every woman must have, unless it completely washes out your complexion. I think it would be difficult to dye a coat. You can dye wool, but the coat already is dyed to the camel color, plus the lining would probably not do well with dyeing. If I were in your situation, I’d just get a scarf in a color that flatters me. Having a flattering color near your face should lessen the “look like death” effect. I think this is a great idea – a scarf can make a huge difference. I like to wear colorful $5 pashminas with my (black) coat. If the scarves don’t work out for you and it happens to be a 4/6 petite, I will buy it from you! I’ve had that coat for several years and love it. This is the kind of coat you would wear for years. It is most likely well made so it will last. At $699, that is not a splurge if you amortize the cost over the years you will wear it. Of course, if you will look hideous in this color, don’t get it, no matter how great a value. I don’t know; I feel like I’ve bought $100 coats that look substantially similar and lasted about three years (and I’m careless and hard on clothes). Given that, this would have to last 21 years for me to break even. Even 15 – factoring in a few hundred for the no-doubt superior fit and tailoring – strikes me as overly optimistic, given that I might spill something or gain or lose weight or suddenly get a yen to move to a different climate. True. To me, “wear it for years” means 10 to 15 – but there’s always the risk that I’ll move to a different climate or that I won’t like it after 5 years (and the other risks you mentioned). That said, I’m taking a lot of things out of my rotation now that I did purchase 10 years ago, so I guess it’s not that far fetched. Yeah, I imagine it depends an awful lot on personality. Some people take great care of their stuff and don’t tend to change sizes much (and aren’t as fickle as I am), so it probably makes more sense for those people. For me, I think I’m pretty unlikely to ever save money on splurges like these. I love it. Love, love, love. I also look terrible in camel and so have been employing the scarf technique commented on above for years. It really does help get rid of the “washed out” coloring, especially if you wear a fun colored hat as well. I totally agree! Also – Kat, can we have a post on winter accessories (hats and scarves) and how to make them work with professional hairstyling? My head is always cold in the winter, but I have curly hair and absolutely cannot wear a hat without ending up having smushed hat hair above my ears and a giant frizzball below them. (Not a good look.) So I end up wearing a pony almost all winter. Have you tried the “behind the head” ear warmers? There’s a brand caleld 180s that’s sold in a lot of clothing stores this time of year – fleece earmuffs where the band goes behind your head so you avoid the excess frizz factor. I started wearing the 180s last season. I hate hats and these did a good job of keeping me warm last winter. Thanks, Shayna. I have tried these but they just don’t keep my head warm enough. I guess I am a cold weather wimp! I have curly hair too and I find that a thin 100% cashmere knit stocking cap keeps my head warm without smushing my hair. What about looping a scarf or wrap over your head, such that it makes a more-flexible version of a hood (or maybe my mental image is more stylish than this would ever turn out in person)? You could also try those endless-loop type scarves that popped up last year (if they’re still around) for warmth without pressure? Cat – good idea. I’ve tried it but end up feeling like Baba Yaga or my grandmother. Anonymous – thanks for the tip! Same anonymous here – I also do the scarf thing. I find it works best with silk/pashmina scarves – synthetic fabrics create frizz. I realized that most of the smushing comes from hats that make my head too hot, so I sweat, hence the thin cashmere. Nice coat, but I don’t love the buttons. Looking forward to a roundup of winter jackets! On a hijack note – I walk to work most days. It’s quite a long way (50 minutes or so) and I get hot walking and get changed at work to avoid extreme grossness. What can I do to make sure my work shirt doesn’t get creased along the way? I carry it either in my handbag or in a backpack. I have tried wrapping it in things, folding in different ways, rolling it up… However, once again this morning I arrived at my desk looking like I had slept in my shirt! Thoughts would be most welcome! Can you keep your shirts at work? My BF has a closet in his office, and he just leaves a few shirts there, dry cleans those near the office, etc. I think the only way to absolutely avoid wrinkles would be to carry it on a hanger – which I can only imagine would be a huge pain in the @$$ during your walk. Can you get an iron/steamer for your office so you can just steam out the wrinkles when you get to the office? Does Downey still make that wrinkle-releaser spray? I remember using it back in the day (high school!) and it worked fairly well. I love the Downey spray. Just watch out – on certain materials (e.g., a heather gray Banana Republic skirt that I love), it makes the color run / shows up as a big stain mark. Any possibility that you can take a bunch of shirts to work with you on one day (maybe get a friend to drive you) and leave them there, bringing them home to wash as needed? I do have a closet at work, but it really comes down to the fact that there would then always have to be one day that I don’t walk in. Sometimes that happens anyway e.g. if it’s raining like crazy or I’m going away for the weekend, but it’s harder to plan. If I didn’t walk, I’d have to get the train and it’s a commuter train which is so full of people that my hanging shirts would probably suffer just as much. Thanks for the idea though, always good when people think outside the box, which I hadn’t done – just sad that there are still obstacles! Target carries the wrinkle-release spray. I LOVE the stuff. Also, I’d recommend talking with your drycleaner about boxing your shirts. My husband does this with some of his when he is traveling, and they always look crisp. Worth a try. Thanks, S, although sadly I am not one of such means (yet) to be able to afford to dry-clean my shirts! It’s machine-washable all the way! If you walk w/ a backpack could you hook the hanger through the hoop at the top so the shirt hangs from the top of the backpack down your back. If it is in a garment bag it should stay clean and your hands will still be free as you walk. Most polyester shirts don’t show wrinkles at all. I never iron them and nobody knows the difference. Good Morning Corporettes! I’m looking for a little advice… I woke up with one very puffy eye lid this morning. I think it’s allergy related. Any tips to deal with this if it happens again? How to minimize or camouflage it? Or better yet, how to prevent it? Now (nearly noon here) it has mostly receded, but there is still a little puff. My office is decorous enough that no one said anything of course, but I don’t want to show up looking like this too many mornings! I had this problem off and on, with one of my lower eyelids swelling periodically, a few years ago. The only thing that worked for me was a trip to the optometrist, who wrote me a prescription. I recommend going sooner rather than later, because — yes– it really does make you self-conscious! Thanks MM. When this happens to me, it’s only on which ever side I slept on, so I don’t think its an infection or something that would respond to antibiotics. But I guess a call to the dr. couldn’t hurt! If that’s the case, it could be allergies. I notice this happens to me if I wind up sleeping on my face (I don’t know how I breathe, but there you go). You could be allergic to your pillowcase, pillow, or you might need to change your pillow because it’s old (old pillows can harbor lots of dust mite and their dead body parts, shudder). Now that I think on it, I should really change my pillows. I don’t know how often you should change them but I try to change them once a year. You could wash and dry your pillow but it takes forever to dry. This happened to my daughter. The eye doctor said it was blepharitis, sort of an inflammation of the eyelid, caused at the eyelashes. It was resolved by keeping her eyelids clean, either by washing gently with baby shampoo or special eyelid washing cloths you can get at a drugstore. After we got it all cleared up, it hasn’t come back. I don’t use it for lifting or as a mask — but to de-puff I put on a small bit under my eyes or on the lid, under my regular eye cream. It works fairly great. No washing off. You could also try taking an allergy pill (zyrtec, etc.) before you go to bed. But that’s if it’s an allergy, in which case I would talk to your doctor first, too. PS: I know the mask is pricey — but the same tube lasts forever if you’re using it for your eyes only. I have this periodically. I was ultimately diagnosed with idiopathic angioedema (spelling?) — basically an allergic reaction to nothing in particular, or a malfunctioning of my allergic system. Allergist said it is pretty common. A daily Claritin keeps it at bay. You might try that. Thanks for the thoughts on this, ladies. Such a random problem, but I’m glad I could bring it here and find helpful ideas on what to try! One more suggestion. I wake up with puffy eyelids way too often. I think its because I’m older and likely will be needing an eyelift one day sooner than later. However! Each night I run very hot water thru two black tea bags and then place them in the freezer. Next morning, I scrub my eyelids with a warm cloth (roceaca of the eyes). Then I go back to bed and put the frozen tea bags on my eyes until they are thawed. Takes about five minutes. My eyes are clear, white, and the swelling is gone. This really works. But only with tea that has caffeine. I tried it with flavored tea and with green tea. Big bust. Okay, it’s rosacea, not rosecea. I love a great camel coat, and am willing to splurge because it’s a timeless classic, but this one doesn’t look special enough for a splurge. It’s not a great camel IMO, the collar’s a little off … it doesn’t look appreciably different from a cheaper one. I would really like to invest in a great water-proof trench coat. Can anyone recommend one that doesn’t cost a fortune? I got a London Fog coat 2 years ago, and the water repellent properties are incredible. It looks like they’re on sale now at Amazon for about $100. Search for “London Fog Women’s Single Breasted Belted Trench With Tab”. There are a ton of LF on overstock, too. Second the London Fog rec. I love mine. 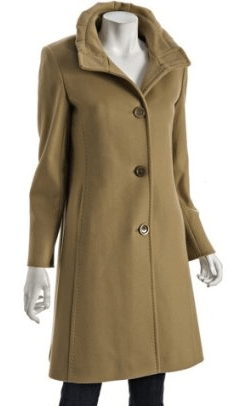 This coat is camel-colored, but not actually a “camel coat” – I might consider a splurge for a camel coat, but there a million camel-colored wool-cashmere blend coats out there. I’ve had one of the J.Crew ones, with thinsulate, for years, and it still looks great and keeps me warm. Agree – a wool blend is a cheaper version of a real camel hair coat which is a “true investment piece” (I’m quoting my grandmother on that one! )… which makes this an overpriced trendy coat, with a weird collar. Has anyone has a coat re-lined? My winter coat is a black wool/cashmere blend from J. Crew that I got the winter of 2003. The coat looks brand new with the exception of the satin-type lining. It’s starting to wear with some rips/tears in places. It doesn’t really bother me but I was thinking i should get that fixed or the wool part may start to wear. Plus, well, It doesn’t look great when taking it off if anyone were to see it. They still sell the coat and I was contemplating just buying it again, but I am thinking it has to be cheaper to re line then to spend 400 bucks on an indentical coat. Well, correction. I don’t currently see the coat, but they had it last winter and I would assume it would be brought back this winter when they have more winter coats on the website. I have had the lining repaired on my coat (which sounds very similar to yours). There was a big raggedy patch where my tote bag presses against my hip when I walk, and the tailor (my usual dry cleaner, who is also well regarded for tailoring) just cut the offending part out and patched it. Because it is lined in black, the seams barely show and the fabric was easy to match. It was probably $10 or so — so definitely worth inquiring about. This is a pretty straightforward job on most coats. I could do this myself, if I had the time. The tailor would remove the existing lining, take it apart at the seams, pin it to tissue paper (or the new fabric itself) and cut out an identical new lining. Sew it together and attach it to the coat as per usual. Done. The only thing tricky would be if there is a weird angled seam inside but if it is a normal winter coat (or a suit jacket – same idea) that would be easy. I wouldn’t think it would be more than $50 but that’s a guess, and would be worth it if the coat has some life left. I think you should take it to a tailor that does suit jacket type work. Ask at your local Nordstroms, Talbots or Brooks Brothers and see if they have a tailor that they recommend for out-of-store alterations. Some drycleaners might have the ability to do this. Good luck! Any competent tailor should be able to do this for $50 or so. If you just want the existing lining patched, it should be even cheaper. I’m not sure this is such a good deal. I’ve gotten pure cashmere Cinzia Rocca coats on sale at Neiman Marcus that were similar (although more classically styled), and paid even less. It makes sense to keep shopping. And the older coat is a good 10 years old, and looks fantastic. This is the year for camel color, and yes, EVERYONE can wear it. If it is not your very best color, simply wear it with a scarf near your face that contains camel plus your best color, be it pink, blue, green.